Lily has lots of dolls and she loves looking after them like real babies. Lily already has lots of accessories including the Baby Annabell Bedroom, Baby Annabell High Chair and the Baby Annabell Bath. 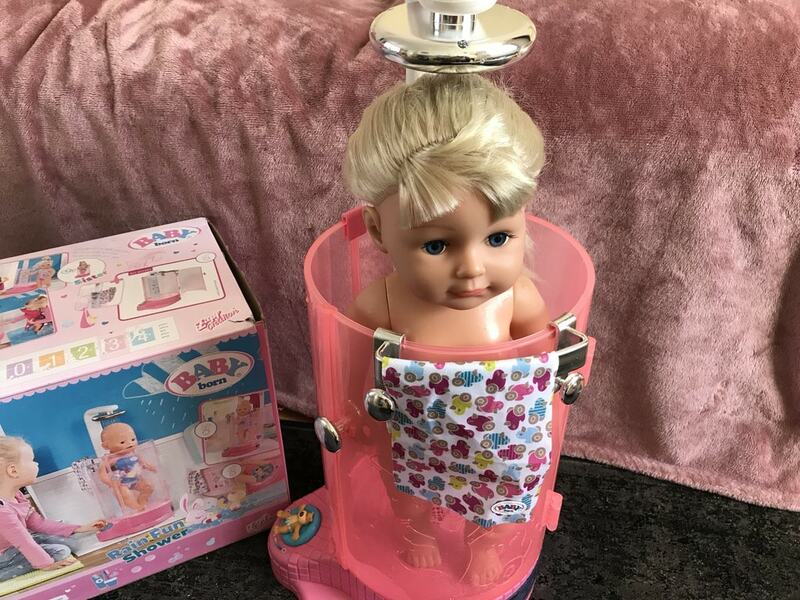 As soon as Lily saw the advert on TV for the Baby Born Rain Fun Shower she wanted it. Luckily, I was offered the chance to review it so Lily was able to get her hands on it sooner! The shower retails at £39.99. The shower is great fun, Lily was amazed to see that it actually worked and real water comes out. She loves all her dolls and was really excited to shower the waterproof ones. She showered how Baby Born Swim Doll and Baby Born Sister Doll. The shower comes in a beautiful presentation box. The shower needs to be assembled, but it was straight forward and took about 5 minutes. The pieces slotted into each other really well and the shower unit itself is well sealed once the door is shut. I did manage to get soaked as I didn’t quite follow the instructions. The instructions demonstrated filling the water tray with a jug and I thought I would just remove it and fill the water and the replace it like I do with my iron. As I was replacing it my hand wobbled and the water came over the sides of the tray. There are 2 small holes in the plastic underneath the tray and both myself and my kitchen floor ended up a little wet! Note to self, it you fill it with a jug it doesn’t go everywhere! As I know now about the 2 small holes, it doesn’t cause an issue, but I did want to warn you! We will now keep the Shower in the bathroom in the winter and use it in the garden on hot days in the summer; that way at least if Lily accidentally tips it the water is in a contained area. The shower works with any waterproof hard backed doll from the Baby Born/Baby Annabell collection. Do not use the shower with any of the interactive/battery operated dolls. The shower uses real water so do not use it near electricity or anything that could be damaged by water spills. If you are buying the shower as a present then remember to buy 4 x AA batteries to go with it. 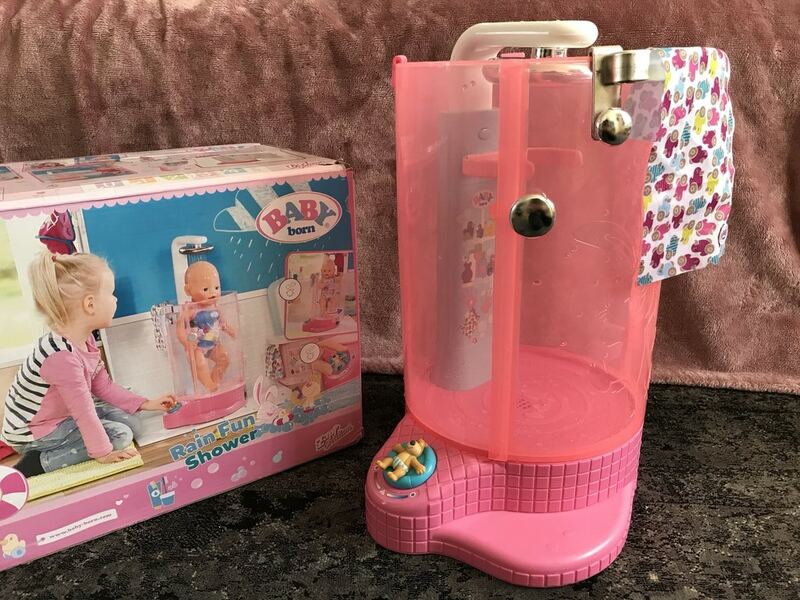 Disclosure: We were given the Baby Born Rain Fun Shower free of charge for this review but nonetheless the opinions in this post are my own.